The delivery of music education in schools and the extent to which quality provision can radically change the lives of children and young people very rarely makes the headlines. But in the case of Feversham Primary in Bradford, West Yorkshire, the national press were keen to share the story. Since the school introduced music as a compulsory subject, it has gone from special measures to now being in the top 10% of schools in the country. Music Mark caught up with Jimmy Rotheram, the school’s Music Coordinator. Here he shares Feversham’s journey as well as his own as a music teacher, and tells us how he has witnessed first hand the transformative effects of music. What was the situation of the school before music became a compulsory subject? The school was just coming out of special measures. The curriculum was not engaging and SATS results were poor. Musically, we were at ground zero. There were about 3 children in each class who could sing in tune, and only half of each class could keep a simple pulse in time. Children had been cajoled to sing as loudly as possible, which meant a lot of shouting! After teaching A-level music, Primary Music Education was a new adventure for me as well as the school. You could say I was suddenly thrown into the shallow end! How did the idea of making music as a compulsory subject to turn things around come about? Music was not brought into the school with the specific goal of improving results. However, Naveed Idrees, our new head teacher in 2012, had always championed music and arts in education, as a way of developing children’s confidence, social skills, concentration and their “spiritual” side. Without head teachers like this, music in schools will struggle. Did you have other examples to lean on or was it just a huge leap of faith? I would describe it as cautious steps of faith, rather than a leap. We didn’t suddenly switch to lots of music every week, and didn’t make all of our investments at once. Whilst Naveed devotes a generous percentage of our budget to the arts, he is not one to wildly throw money around. Every idea had to be researched, planned and justified. Schools can often make the mistake of buying a lot of equipment without necessarily having the expertise to make the most of it, when it might be better investing the training to deliver quality singing and body percussion. As Kodály says, “To teach a child an instrument without first giving him preparatory training and without developing singing, reading and dictating to the highest level along with the playing is to build upon sand”. How did you begin to introduce music as a compulsory subject? I started at the school as a supply teacher, teaching years 5 and 6 on a Wednesday afternoon in a tiny space, half of which was taken up by the piano. The kids loved the lessons and were highly engaged, but at this stage I was merely a children’s entertainer – children were still singing out of tune and struggling with basic musical skills. I knew I needed to start earlier with children and ended up doing 2 days per week teaching years 1 to 6. However, I was quickly learning. My research drew me to the Kodály Approach. Not only did the philosophy entirely match mine – music should be fun, practice and participation should never be coerced, and EVERY child is musical if trained properly. I also discovered that every child in the school could sing “so” and “mi” songs in tune, and the approach gave me the tools to build up musical skills from there, through lots of fun and games. The British Kodály Academy have been brilliant in mentoring and training me over the last four years. What is your current music education offer? Quality music education from birth to 11 years old. The journey starts with parent and baby groups. In Nursery, games and nursery songs and rhymes unconsciously prepare musical elements – high and low, fast and slow, phrasing, dynamics etc. There is also a lot of work on exploring the voice – in the course of a lesson, children will use their singing, whispering, talking, high, low, loud, quiet, fast and slow voices, all together, in small groups as well as lots of solo singing. Animal noises are also great for exploring a range of sounds and vowels – cows, monkeys, sheep, wolves, snakes etc. Games are also designed to build confidence and life skills such listening, turn-taking, sharing, working in pairs, working all together. Puppetry is also important at this age – children will often rather sing to a puppet than a human. By the time they leave nursery, most children are singing in tune and keeping a steady pulse and copy simple melodies and rhythms accurately. This step by step journey to musical literacy continues throughout school. My current leavers will be able to do all this with do major and la minor pentatonics, but expectations are getting higher every year as each year has had more training – I hope my next set of leavers can do even more. The music assembly, with guest musicians and the whole school making music together, as well as pupil performances, are a highlight of the week. 15-30 minutes solfa practice, or preparation/reinforcement. 20 minute group lesson in trumpet, woodwind, kit drumming or electric guitar. What changes have you seen in your school and students since music became compulsory? Thanks to our creative curriculum and our work as a team, we have gone from special measures to being in the top 10% of schools in the country. The Kodály philosophy runs throughout school in all subjects – make learning “always a joy, never a torture”. Prepare learning carefully so that each step is approached with confidence, awe and wonder. We are a happy school with an amazing atmosphere and high expectations. Learning behaviour is now excellent, with improved listening and focus. High self-esteem means less bullying, improved attainment and higher attendance. Children and staff love coming to school! Every child is musical and many are exceptional for their age. Why do you think music in schools can be so powerful? Music is a rigorous academic discipline in and of itself – giving so many children the gift of musicianship, artistic appreciation and self-expression should never be under-valued. What would be your message to schools where music is not a priority and/or has been removed from the curriculum? Sadly, the golden “window of opportunity” for both brain development and accurate pitching is 3-6 years old. Primary Schools have a duty to provide this – read the thorough research of people like Dr Anita Collins and Dr Katie Overy into the effects of music on the developing mind, and its many benefits for children with needs such as dyslexia, autism and ADHD. I think once this is known, it becomes very difficult to justify cutting music from schools and instead we should be looking to provide the best musical education possible, as early as possible. This will lead to more demand at secondary and tertiary levels. People who have only ever seen in black and white may never appreciate what it means to see in colour. However, most head teachers sincerely want a more rounded, creative curriculum, but feel shackled by budgets, statutory requirements and our testing culture. At Feversham, we have the same budget as other local schools. We prioritise music in our budget , but we also trim waste. We spend virtually zero on supply teachers, and have 1 non-teaching member of senior management – the head teacher. We also thought music would be a better investment than dry consultants bringing more of the same old solutions. Employ a music specialist and spend your budget on getting them trained in a thorough music pedagogy system. I am Kodály trained but Dalcroze, Gordon, Orff, and Suzuki are all brilliant methods too and there is a huge amount of cross-over. The Kodály based Jolly Music scheme is a must for primary schools, and in the early years can be delivered by non-specialist staff. I’d also recommend that all music teachers go on the BKA Summer School – it’s incredible and was life changing for me. What help do schools need to continue providing music education? Sadly, until the goalposts shift and awareness of research improves at policy level, music will often be seen as something to apply the bare minimum of thought and resources to. Every primary school should have a specialist music educator with professional qualifications in one of the major music teaching systems – one well trained and enthusiastic member of staff in each school is worth a million ipads with garage band, or a year of playing trumpets with someone they will never see again, so funding should be spent accordingly. A lot of schools are outsourcing their music education, with very mixed results and often at high cost. A music education specialist is much better value, providing planning for high standards over time, training for other staff, and can marry the curriculum with the schools core values and objectives. They will also have the skills to develop high quality musicianship across the board and nurture children through this journey. Organisations like the British Kodaly Academy and The Voices Foundation can provide in school training for music coordinators to provide all this and become a music education specialist, rather than a musician who teaches, like I used to be. 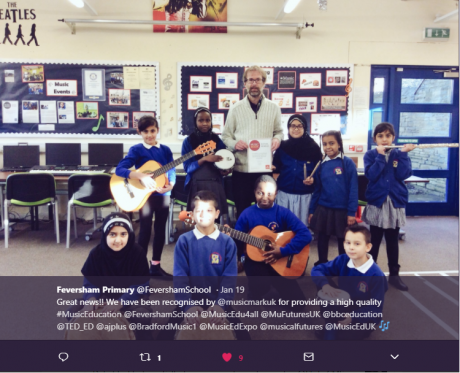 Feversham Primary School is a Music Mark School Member. Click HERE for more information on School Membership.